“Allocate”. Governments allocate. People merely spend. Soon India will be just like the developed world, and almost all the education stories from India will be of how dreadful education is becoming, and that now that it is so bad, there should be lots more of it, paid for by the state, which is what made it so bad to start with. There will be no stopping this ghastly trend. Indians have had no practice at explaining that because education is so important, and because the children are our future, blah blah blah, that’s exactly why the government should stay right out of it. They will merely say fatuous things like: we can’t afford to spend this much. Which may be true this year, but it concedes the point that matters, which is that if we could afford it we obviously should. So when we can, there goes the neighbourhood. Amit Varma notes that Cambridge University is establishing a Jawaharlal Nehru Professorship of Indian Business and Enterprise. Nehru, the first Prime Minister of India, studied Natural Sciences at Cambridge. … to facilitate the fund-raising activity of Cambridge or other UK institutions raises several questions. It is common knowledge that post-Thatcher era, educational institutions in the UK have been forced to raise the fees, particularly for foreign students. Even so, the fees do not cover even 25% of the cost of running these institutions. Hence most of these institutions are going around the world with a begging bowl camouflaged as road shows for their graduate and undergraduate course. They are desperate for funds and their endowments/ corpus is much lesser than that of US universities. Cambridge, each with around $5 billion as endowments, are far behind Harvard and Yale, which are flush with funds to the tune of $50 billion and $30 billion, respectively. Even comparable US universities like the Texas System or Michigan have much higher endowments than them. Now, why should a developing country like India fund the declining institutions of the West, and more so, those of the UK? If Cambridge was so fascinated about Nehru entering it as a student or about the India Story, it should have approached a private financier or company in the UK to fund this endowment. It is also ironical that the professorship is for business studies, while Nehru was the architect of the licence permit quota Raj in India. It is like the butchers’ association of Texas providing a chair to study Gandhian thought in some US university. At that LA dinner I attended last night, there was talk of the Oxford and Cambridge “brands”, and of how strong they are. This piece by Vaidyanathan suggests to me that maybe these brands aren’t so strong after all. 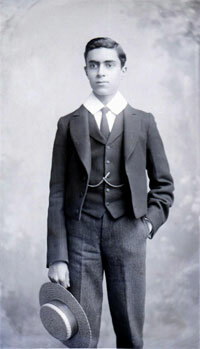 The picture of Nehru that I have used, which I found here, shows him as a Harrow schoolboy. Here, there is a picture of the young Nehru as an officer cadet at Harrow. After Cambridge, Nehru became a barrister at the Inner Temple, so Nehru had the whole posh English education treatment. (This must have been where he got the idea of regulating the life out of the Indian economy.) These two pictures were taken over a hundred years ago. 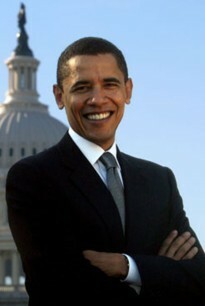 My bet for the next President of the USA (following on from this conversation) is Barack Obama. 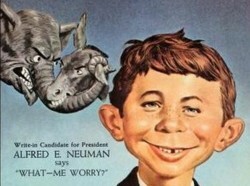 He will beat Hillary and he will beat McCain, I think. Here is a report about Obama’s views on education. He is in favour of education being good and against it being bad. He said the U.S. needed teachers who could instruct American children not only to excel in mathematics and science but also in other subjects. Now why hadn’t anyone thought of that before? But what is more interesting is that the way he decorates these vacuities is by talking about kids in India and China, hence the Hindu Times picking up on this. They are scared of us! Hurrah for us! Hurrah indeed. UPDATE: More about candidate education policies here. The education sector in India as the concept of ‘business of education’ catches on with India Inc. Considered a ‘social responsibility’ all these years till now and plagued by insufficient infrastructure, the Indian education sector has huge room for improvement. Increasingly, there are companies on the horizon providing e-learning services, tutoring for kids, coaching institutes expanding their ambit to provide mainstream education, setting up schools, entering the B-school segment et al. Companies like Educomp, NIIT, Tutorvista, Zee Integrated Learning System, Career Launcher, Extramarks, an online tutoring portal for kids, Aptech, Time, IMS, skill enhancement company Abacus Learning are all party to this. Another highlight of the change is the public-private partnership model on which much of the growth of this sector is pinned on. It’s the kind of transition that’s sweeping the Indian education system. Gaja Capital’s $8.25 million investment in Career launcher, Helix Investments pumping in $12 or Mahesh Tutorial and SAIF Partners investing $10 in an English training Academy Veta, are all indications to this. Instances like these are plenty. Once can only imagine the profound effect all this has on the attitude of Indians towards doing business, and towards all the other benefits that doing business creates. If only we in Britain had a government that didn’t have billions to throw at education, this would leave the field clear for the private sector. Let’s hope that these Indian education businesses eventually all establish branches here. Fund schooling, not schools. Our education system has failed because parents have no choice. Two things can change this. One: We should allow private schools to open and run without any conditions at all. Two: Instead of funding schools, we should give school vouchers to parents, empowering them with the power to choose whichever school they want for their kids. Follow the link to read Varma’s argument in more detail. Somehow you can’t quite imagine this kind of thing happening here in Britain. Sport icons like Anil Kumble, Brett Lee and Viswanathan Anand are all now playing on a different pitch. After being popular faces for brands ranging from consumer durables to biscuits, these sporting icons are now lending the awe their persona generates to educational institutes. For instance, Indian test cricket captain Anil Kumble, who has so far advertised for brands like Samsung and Indian Oil, will now be the face of Manipal Education. Last month, Manipal Education announced Anil Kumble as their global brand ambassador. Similarly, Deakin University too, recently announced Australian fast bowler Brett Lee, as the brand ambassador for Deakin’s activities in India. Viswanathan Anand has been advertising for NIIT for the past nine years and would continue to do so. He has also advertised for Parle Milk Shakti biscuits in the past. Being a cricket fan, I know exactly who Anil Kumble and Brett Lee are, and I long ago clocked that Lee is a big name in India. But Anand? He’s the world chess champion, which gives out obvious academic vibes. Good to know that Kumble “excelled academically”. But how academically successful was Brett Lee? A trier, then. Fair enough. One of the great education stories just now is unfolding in India, and all the progress is being made in the private sector. The state sector is very poor, and they can’t affort to throw silly money at it, the way they do here in Britain. You get all this business jargon in British universities – “achieving our mission”, “quality outcomes”, and so on - but it doesn’t convince you that they’re really being businesslike. In India, it does. Maybe distance is lending enchantment to my eye, but I don’t think so.